We are highly appreciated by our client due to our quality assurance police. Leveraging on the relentless efforts of our professionals, we are capable of offering an immaculate range of Single Track Injectable Powder Filling Machine. 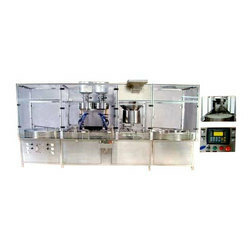 These machines are highly suitable for round vials. Our clients can avail these machines at competitive prices. Looking for Injectable Powder Filling Machine ?